Owens Valley is a special place any time of year, and during the peak of fall color around the start of October, it is one of the best places on the west coast to see the leafs turn. Specifically, the stretch between Big Pine and Lee Vining showcases many trailheads that feature decent to great fall color viewing. Most tourists and photographers flock to the most prominent locations, such as North Lake, Convict Lake, and Rock Creek, which leaves the rest of the locations surprisingly empty despite their fantastic appearance. Armed with this knowledge, and a favorable weather forecast with highs and lows that resembled August more than October, Callie and I headed up to the Sierra for a quick one night backpacking trip to get a taste of fall and visit a classic Sierra lake that had alluded us on a previous trip. We hit the trail on a Saturday morning early enough to catch first light on the mountains and have the trail all to ourselves. The trailhead at Big Pine is around 8,000 feet, and the area is a typically dry eastern Sierra landscape dominated by sagebrush and manzanita. The occasional jeffrey pine dots the landscape and helps remind you that you are actually in National Forest. The nearby creek is lined with mountain birch, which is one of the few trees in the area that showcases fall color. There are a few spots where one can combine a view of the trees with the surrounding peaks to create some especially satisfying vistas. After about a mile and half up the canyon, the trail crosses the creek, and begins a steeper ascent towards Brainerd Lake. The upper section of this hike doesn’t show much in the way of fall color, so our interest quickly turned to Finger Lake a couple thousand feet above. We have covered this section of trail more extensively already on a trip where we failed to reach Finger Lake, so that increased our incentive to move forward into uncharted territory. By noon we were at Brainard Lake without the altitude sickness and swarms of mosquitoes that had accompanied us on our previous visit. This is a perfectly beautiful lake, but just a sampler of what lies ahead. As the south fork trail approaches Brainerd Lake, it becomes a bit more faint and there are a few spots where it is easy to lose. Once you reach the lake, you are on your own if you want to move on to Finger Lake, so some confidence in off trail navigation is key. No matter which way you take, you will have to deal with slogging through a few hundred vertical feet of boulder fields, which is never fun, nor particularly easy when carrying enough gear for backpacking. This is most likely why Finger Lake does not get more crowded, so keep that silver lining in mind if you find yourself cursing during the last push towards the lake. By the time we reached the lake, I was wiped out from the last stretch of boulder hopping. Make no mistake, capping out over 11,000 feet high with 3400 feet of elevation gain is a tough hike, especially if you are coming from sea level and have had no time to acclimate. Carrying backpacking and photography gear only makes the ascent more difficult, but who wants to leave such amazing places so soon after arriving? It’s a pretty wonderful place to have all to yourself for a night too. There were a few other spots around the lake’s outlet that could have supported additional visitors, but overall, camping around the lake appeared to be pretty sparse. One potential downside of the lake is that you might have to make friends with your neighbors if you camp here on an unusually busy weekend. Heading down, the first hundred feet of descent is easy off trail with a nice open view of the middle of the south fork basin. Then, you get to pick your poison as you descend the boulder field above Brainerd Lake. On the descent, we chose a route further to the south than our ascent route. I think this route was close to the “official” route, as I saw a few cairns along the way. It didn’t really matter though. In fact, I think that our ascent route was probably easier. No matter what way you go, the elevation gain is the same and the boulders are relatively the same size. Once back at the lake, the next 3000 feet of descent to the trailhead felt quite easy in comparison to the start of our day. At first, splashes of fall color occasionally dotted the trail as we walked through the higher elevation alpine forests. Then, as we reached an outlook over the lower section of the canyon, the full splendor of fall came into view. Seeing this magnificent display shortly after waking up next to a spectacular glacial lake was not a bad way to start a Sunday. As we retread our steps back to the trailhead, we were surrounded by the wonder of fall color in the Sierra, and we had it all to ourselves. The only downside to a weekend like this, is that it can be really difficult to accept reality again on Monday. Beautiful pictures! What do you think accounts for the bright green color of the lake? A combination of glacial flour and algae? Thanks for blogging about your trips. The color of the lake is caused by runoff by the nearby glaciers. This is what glacial lakes look like given enough runoff. Is this trail frozen over in February? Oh yeah. It’ll be frozen over until early June. By frozen you mean snow throughout the trail? So even though after late June would still pretty cold at night? Yeah. The amount of snow left on the trail doesn’t always correlate much with how cold it will get at night though. Late June should getting to about as warm as the High Sierra gets. Speaking of frozen over, I was there this week and Finger Lake had a thin sheet of ice. Thanks for posting this article. I finally got there but only after an 11 hour day hike. The rocks at the stream crossing were icy also. The hike up and down the boulder filed from Brainerd Lake was my biggest challenge but the view was worth every step. Great report and great pics as usual. October. maybe I just might give it a shot before the cold and snow start to come in! One of the advantages of a short trip like this is that you can make sure you have a favorable weather forecast before you head in and be relatively confident that it will stick. We had perfect weather on this trip. The weather can vary a lot during the shoulder seasons. I have enjoyed you blog for a while for both your write-ups and the images you include. This post is not different BUT the glaciers on the Palisades are not the biggest in California. They aren’t even close. They are the largest in the Sierra Nevada but the glaciers up here on Mount Shasta are larger. 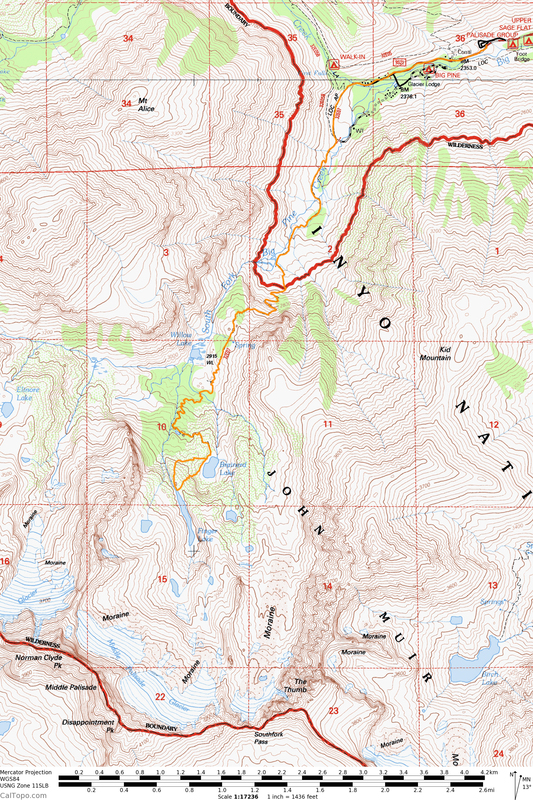 The big four, Whitney, Bolam, Hotlum and Wintun are large, even by Cascade volcano standards. Great work on the blog! Thanks for the correction. I should know that since I have summited Shasta :). If we would like to make a day trip to visit this lake, is it possible? Do we need a permit to get in the lake? Thank you! No permits are necessary for day hikes. It is definitely doable as a dayhike, but it would be a long and tough hike. When I visited, the only other people I saw at the lake were day hikers. Thanks for the post. I’m planning to go for a hike this coming fall. Which weekend do you recommend in order to see the fall color there? October 3rd or 10th? October 3rd. Keep in mind that weather at that time of year can dump a few feet of snow at upper elevations, so it’s important to keep a close eye on the weather forecast. Do you remember what lens/setting you used for the vertical closeup of the glacier which included Finger Lake? Was this the Palisades Glacier? That was shot with the 24-105 at 47mm. That is not Palisades Glacier. Palisades Glacier is accessed via the North Fork trail. It actually is the Middle Palisade. How much distance do you think would be cut off if this was done as a day hike parking by the walk in campground? Maybe a couple of miles round trip less? Probably about a mile and a half total. On second thought, I think that is the Middle Palisades Glacier. Yes, that photograph. I am surprised that the shot was taken with a 47mm aperture and not wider. The photograph immediately below it must have been closer to the maximum width for that lens at about 24mm. ” That was shot with the 24-154″. Do you mean 24-105? Your trips inspire me to go there also. Part of it is the challenge to try for photographs with the same care, composition and quality as yours. The photo below it was taken from the lake’s shore, so it is definitely on the wide end of the spectrum. The shot at 47mm was shot from a cliff overlooking the lake so it ended up more in the middle. Heading out here for a two night trip starting on 10/13. First time in the Sierra Nevada. Any advice for a first timer?